The art of beautiful handwriting. Calligraphy is the art of decorative handwriting or lettering. In China, calligraphy has an especially rich history and was traditionally considered to be the supreme visual art form, above even painting and sculpture. Its origins date back to over 3,000 years ago and calligraphy remains an important part of Chinese culture to this day. Just like calligraphy in other cultures, Chinese calligraphy is beautifully handwritten text. However, one important difference is that in written Chinese, a single character usually represents a single word or phrase (unlike letters, which have no direct meaning on their own). Because each character has a unique meaning, its visual qualities — the overall composition of the character and the look of each stroke — become much more important. To be considered good Chinese calligraphy, characters should be written clearly and in one of the 5 standard script styles. What’s more, characters cannot have any flourishes or elaborate ornamentation. For that reason, the key to Chinese calligraphy is expressing emotions through subtle variations in the shape and weight of the individual strokes in a character. For example, a lightly applied brushstroke could make the viewer think of patterns left by geese swimming in a calm pond, while a heavier technique could resemble boulders falling down a mountainside. “I have seen the wonder of a drop of dew glistening from a dangling needle, a shower of rock hailing down in a raging thunder, a flock of geese gliding, frantic beasts stampeding in terror, a phoenix dancing, a startled snake slithering away in fright.” – Chinese calligrapher Sun Guoting (646–691) on calligraphy. 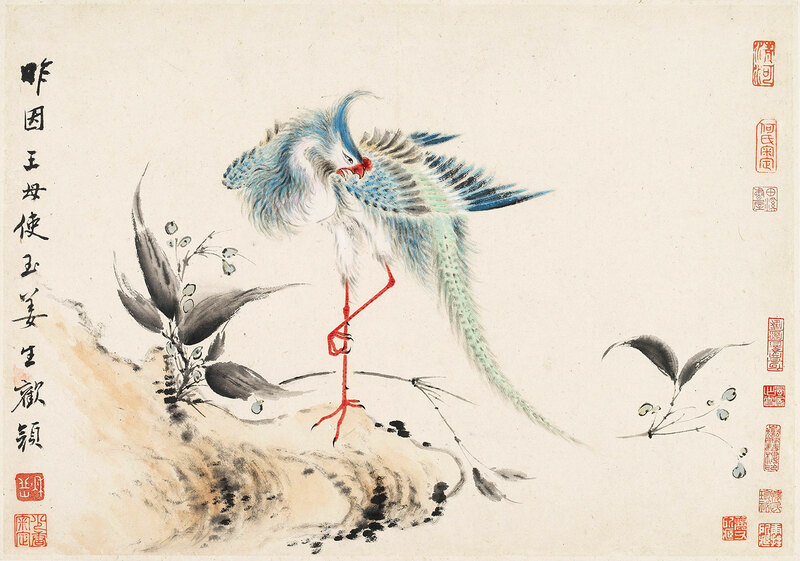 The featured artwork is Birds and Flowers (1747) by Hua Yan.